A good pair of binoculars can come in handy in many situations. For anyone who enjoys watching sport or is a novice or occasional bird watcher, a good pair of budget binoculars can make your life so much easier. The best binoculars under $50 will be able to help you out in any situation you find yourself in. If you are looking for a pair of good, all-round binoculars at a reasonable price, there are a few things that you will have to keep in mind. This includes features such as magnification, durability and whether your binoculars are waterproof. Finding the right pair of binoculars with a limited budget isn’t always an easy job. However, any one of the following reviewed binoculars will make a great addition to your lifestyle. The Bushnell 133450 Falcon 10 x 50 is a versatile pair of binoculars that will provide you with crystal clear images and wide angle view. Even though these binoculars are very cheap, their performance doesn’t necessarily reflect this. Focusing these binoculars is made easy with the Bushnell InstaFocus system, regardless of the weather conditions you find yourself in. This system allows you to focus by easily and quickly tilting a lever. Along with a field of view of 300 feet at 1 000 yards, the easy focus makes the Falcon 10 x 50 perfect for tracking objects such as birds and cars that are moving quickly. This 27-ounce binocular unfortunately only has an eye-relief of 9mm. However, for anyone who is looking for a standard, cheap, versatile pair of binoculars and doesn’t want to purchase separate pairs for different occasions, the Bushnell 133450 Falcon is the perfect binoculars for you. The USCAMEL 8 x 21 folding pocket binoculars are compact, light and can fit into basically any pocket. 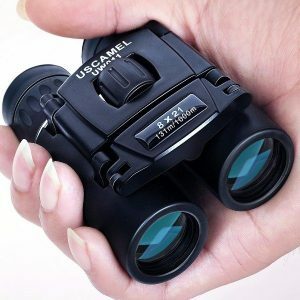 This makes it the perfect binoculars to carry around with you at all times. The image stabilization on the USCAMEL folding pocket binoculars means that the shake of the binoculars will be reduced while viewing. They also have a decently sized eye relief of 11 inches and the fold-back rubber pieces make them perfect for eyeglass wearers. 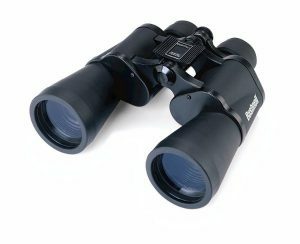 Despite its petite frame and low cost, the performance of the USCAMEL binoculars remains excellent. These rugged binoculars have a durable rubber armour that makes them both comfortable to hold and solid enough to endure any conditions you throw at them. The USCAMEL compact binoculars are also both waterproof and fog proof. Along with this, they feature power magnification and high-quality optics that is equipped with antiglare. This means that these binoculars will come in handy in almost situation, whether it is an indoor or an outdoor event. 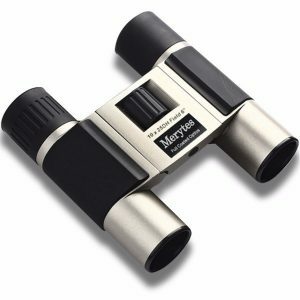 The Merytes 10 x 25 is a high definition pair of binoculars that are both useful and affordable. For everyday activities like sports events, going to the theater and bird watching, these binoculars are perfect. They are small enough to fit into your pocket and the quality metal aluminum alloy and natural rubber construction make the Merytes binoculars both lightweight and durable. However, even though they are meant for use in the outdoors, they are unfortunately not fog proof or waterproof. In poorly lit environments, the multi-layered optics of the Merytas Blue Film binoculars improves viewing with its great light transmission. For a budget price, the multi-layered lens coatings of these binoculars are perfect for viewing subjects that are less than 300 yards away. Along with this, these binoculars features a glass lens with FMC blue film. The film presents the user with minimal colour unevenness and a more precise and clearer view of the subject they are viewing. With a limited budget, you may not be able to afford a top of the line, do-it-all pair of binoculars, but this doesn’t mean that quality and viewing has to be compromised. Depending on what you aim to use them for, any of these three high-quality reviewed models will come in handy in any situation you find yourself in. Nowadays, there are a lot of quality binoculars with low prices on the market. However, picking out the right binoculars for yourself isn’t always an easy task. 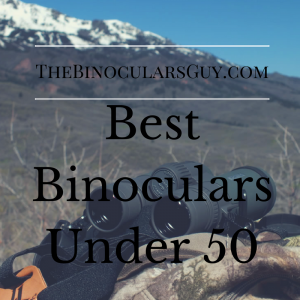 Hopefully, these reviewed binoculars will give you a better idea of which one would suit your lifestyle best and which one is the best binoculars under $50 for you.